Two women have been charged with fourth-degree child abuse in a missing children case fox47news.com first told you about on August 30. Police were called to the 1200-block of Deerpath Lane in East Lansing that morning by Andria Downes who said her three children were gone when she woke up at 6 a.m. After a brief search police found the children with their father in Delta Township. He told investigators his six-year-old daughter called him at work the night before saying she was home alone with her two four-year-old brothers and was scared. Police say the father left work and got to the home in East Lansing at 10:50 p.m. He tried to reach their mother and then took the children to his home. 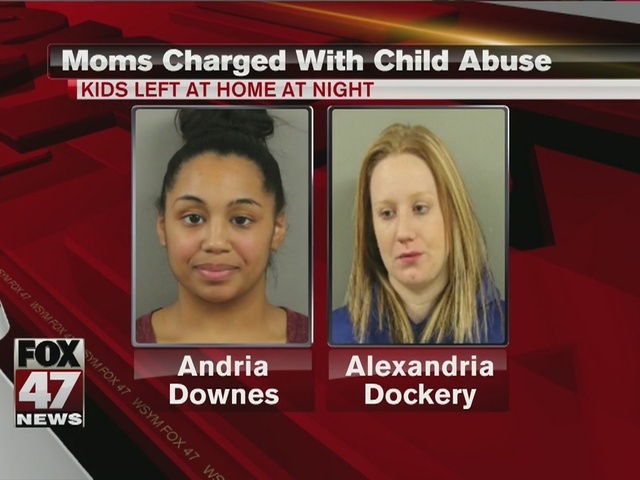 Police say Downes and her neighbor, Alexandria Dockery, had gone shopping together that night. They say Dockery left her two children, ages 7 and 1, home alone as well. Both suspects turned themselves in and were arraigned. Fourth-degree child abuse carries a potential one-year sentence. Child Protective Services has been contacted.